Ethiopia has stepped up its budget for education to over 25 billion Birr with a view to satisfy the nation’s growing demand for trained workforce, Ministry of Education has said. A consultative forum aimed at lobbying for the active involvement and support of partners and the public was held in Adama town on Tuesday. Speaking on the occasion, Education Minister, Shiferaw Shigute the government has stepped up its budget for education to 25.4 billion Birr with a view to satisfy the nation’s growing demand for trained workforce. The Minister highlighted the key role of partners and the public to address drawbacks in the sector as well as ensure both access and quality. The forum reached agreement to work harder to augment student intake capacity, cut the rate of school dropouts and repetitions, ensure a 1:1 student-book ratio, furnish school libraries and laboratories, and build information technology capacity. At the end of the consultation, participants expressed readiness to play their part. An upsurge in ‘new generation’ churches that claim to be able to heal or perform miracles is having a damaging effect on Liberia’s progress in fighting HIV/AIDS, a government official said today. “Unlike traditional Catholic, Lutheran or Episcopalian churches, the new churches claim to be able to give spiritual deliverance, provide healing or perform miracles. This is an attractive option for many people living in an impoverished, post-conflict Liberia,” Logan told Thomson Reuters Foundation by telephone from Monrovia. Liberia, a West African country still recovering from almost 15 years of civil war, has around 18,000 people who need anti-retroviral therapy (ART), the standard medical treatment for those living with HIV. Only 6,000 people are currently enrolled in therapeutic programmes, and a further 10,000 are “in care” because they do not qualify for treatment under WHO guidelines, which stipulate that the patient must have a CD4 count of 350, or be at clinical stage 3 or 4, Logan said. Most healthy adults have between 500/mm3 and 1,000/mm3 CD4 cells, which form part of the immune system, designed to fend off disease when the body is fighting infection. A One Campaign report released today shows that Liberia is the only non-conflict country in sub-Saharan Africa in which progress towards the “tipping point” in the battle against HIV has been reversed. Mali is the only other country where the battle against HIV is being lost. “The tipping point is the point where the number of people being treated exceeds the number of new infections. Liberia treated many more people in 2012 than it has in 2013, resulting in negative progress,” Erin Hohlfelder, the report author, told Thomson Reuters Foundation by telephone from Washington. “We’re hoping it is just a blip, rather than the beginning of a new trend,” Hohlfelder said, adding that funding from traditional bilateral donors has been static over the last two years, leaving many African countries to fill the gap from their own budgets. Logan said he hoped that funding provided by the Global Fund and the ESTHER Project would help to pay for outreach workers to reach isolated communities and ensure ART retention and follow-up, and that international days like World AIDS Day would help persuade local communities not to stigmatise those living with HIV. New WHO guidelines released this year will increase the number of people eligible for treatment for HIV by raising the CD4 threshold for starting treatment to a count of 500/mm3, Logan said. “The national programme is now working closely with these new churches so that they direct known HIV cases to our designated centres for medical care while they provide spiritual support,” he said. 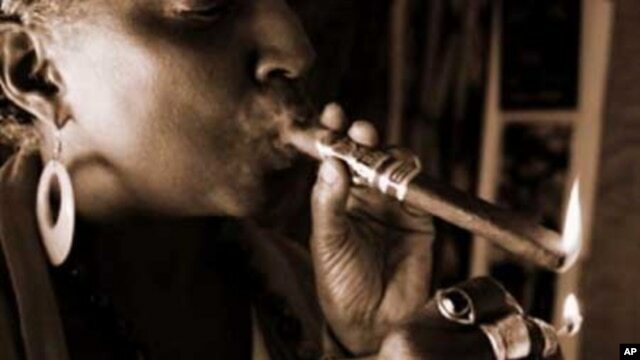 A new report from the American Cancer Society warned that Africa will face a severe health threat from the fast-growing increase in tobacco use. The report combines African smoking rates and cigarette consumption with population trends, and found that without aggressive intervention, the continent will experience a significant increase in smoking in the near future. The report, “Tobacco Use in Africa: Tobacco Control through Prevention,” reveals that Africa as a region has the smallest number of smokers and smallest rate of tobacco use in the world. About two percent of all cigarettes are consumed by smokers in Africa, but they make up about six percent of the world’s smokers. While the numbers are small for now, Evan Blecher, a Cape Town, South Africa based senior economist for the American Cancer Society said these small numbers also provide the greatest for growth. “That means along with it will come an increase among tobacco-related, smoking-related diseases in an environment where health systems are already significantly over-stretched because of infectious diseases like malaria and HIV,” said Blecher. While adult smoking among both among men and women is low in Africa, he pointed out that’s not the case with youth. “We found that African children smoke at comparable levels, and sometimes even higher than other developing regions of the world, particularly Asia. What’s driving this is unclear, but it must be because of significantly more aggressive tactics from the tobacco industry itself. But, also it’s in an environment where children aren’t protected from advertising, marketing… in the way that they are in places like the United States,” explained Blecher. In addition he said,–that while smoking rates are lower in Africa than other regions, it doesn’t mean there is no variation in smoking patterns within the continent. “On the one hand, we’ve got a lot of countries with really low smoking prevalence, like Ghana for instance, or Nigeria,” said Blecher. “And that’s compared to countries of very high smoking prevalence like South Africa or Mauritius, which have prevalence more similar to what we see in the developed world. “But, what we do know is that smoking is declining in those markets like South Africa and Mauritius, and increasing in markets like Ghana and Nigeria. “These other markets which have smaller smoking prevalence are more concerning to us because these are places with much larger populations, which creates a situation where we expect both the number of smokers and smoking prevalence to increase dramatically over the next generation or two,” explained the senior economist. Blecher attributes the decline in smoking in countries such as South Africa and Mauritius to very strict tobacco control policies like advertising bans, smoke free areas, and very aggressive tax policies. “Tax policies are critically important in environments where incomes are growing rapidly, because as incomes grow, everything becomes cheaper and more affordable, including cigarettes. So you need for tax policies to be able to ensure that tobacco products are not becoming more affordable. So in a country like South Africa where we’ve seen tax rates increase dramatically over the last 20 years–we’ve also seen smoking prevalence plummet. Twenty years ago, 33 percent of South African adults smoked, and nowadays only 20 percent of them smoke. It’s a result of deliberate action, rather than luck,” said Blecher. There is a broader movement in Africa towards comprehensive tobacco control policies like advertising bans and smoke free areas, be said, but these efforts are not enough. “Tax policy is something that hasn’t really been pursued by African governments with respect to tobacco, partly because the tax systems aren’t as developed as they are in places like South Africa and Mauritius. So the technical capacity to implement, enforce and administer tax policies is just not where it needs to be at the moment,” stated Blecher. In addition, he said more needs to be done to educate Africans on the dangers of smoking. While most Americans are aware of the risk of disease and even death caused by smoking, the idea that smoking is harmful is mostly not known in Africa, especially in rural areas. As more African countries pursue tobacco control policies, Blecher said people will become more knowledgeable about the harmful effects of smoking. It is not by accident that people in the United States are aware of the dangers of smoking, it is through deliberate action, he said. The US Food and Drug Administration (FDA) have approved Nexavar (sorafenib) to treat some people with advanced thyroid cancer. The drug was already on the market for treating some types of kidney cancer and liver cancer. The new approval is for treating differentiated thyroid cancer – the most common type – that has come back after treatment or that has spread to other parts of the body (metastasized), and is no longer responding to radioactive iodine treatment. Thyroid cancer starts in the thyroid gland, which is located in the front part of the neck. Nexavar is a targeted therapy that can help stop the growth of cancer cells by interfering with signals that encourage them to grow. Nexavar qualified for faster review under the FDA’s priority review program for drugs that may offer a significant improvement in safety or effectiveness of the treatment, prevention, or diagnosis of a serious condition. The drug also received orphan-product designation by the FDA because it is intended to treat a rare disease or condition. The FDA based its approval on a clinical study involving 417 people with advanced, differentiated thyroid cancer that was not responding to radioactive iodine treatment. Nexavar increased the length of time patients lived without the cancer growing by 41%. 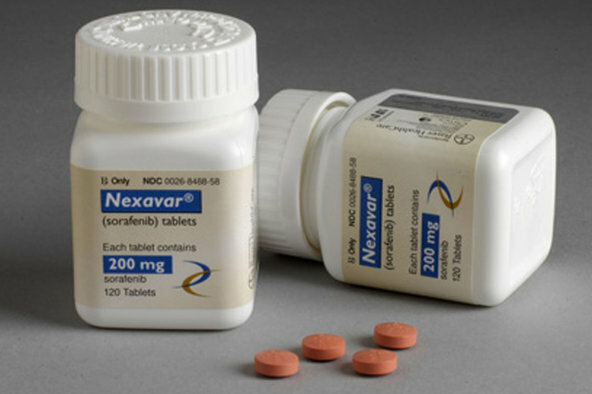 Half the people who received Nexavar lived without the cancer growing for at least 10.8 months compared to at least 5.8 months for those who received a placebo. The most common side effects for Nexavar were diarrhea, fatigue, infection, hair loss, skin problems on the hands and feet, rash, weight loss, decreased appetite, nausea, gastrointestinal and abdominal pains, and high blood pressure. Thyroid stimulating hormone is more likely to become elevated while on treatment with Nexavar, requiring adjustment of thyroid hormone therapy. Nexavar is co-marketed by Bayer HealthCare Pharmaceuticals Inc. and Onyx Pharmaceuticals. Noting that about one million deaf children in the country are in need of modern medical treatment like cochlear implantation, Union Environment Minister Jayanthi Natarajan today said a holistic effort by government, medical fraternity and others would help in propagating the technology for the benefit of such kids. “Even though more than 20,000 cochlear implantations have thus been done across India, we still face an uphill task with potentially one million children awaiting implantation, for many of whom cost of implant is a deterrent,” Natarajan said. She said this fact has come to light from the Central government’s deafness survey titled “The National Program for the Prevention and Control of Deafness”. The minister was speaking after inaugurating the 9th Asia Pacific Symposium on Cochlear Implants and Related Sciences (APSCI 2013) here. “States like Tamil Nadu, Andhra Pradesh and Kerala have taken the initiative for totally funding cochlear implants through their ‘Chief Minister’s Comprehensive Health Insurance Schemes’, which has motivated other states to follow up in the same way,” Natarajan informed. “Such an effort can be fulfilled only when technology is propagated to all rural areas across the country and the success of such an effort would lead to realising a deafness free India in the near future,” Natarajan said. The minister said the science of deafness was undergoing rapid changes in recent times. “…There is a need for updating the recent advances among the medical and allied fraternity (otolaryngologists, audiological scientists etc) and the symposium is a step in that direction,” she said. The APSCI 2013 is being attended by over 1,000 delegates from around 60 countries across the globe. In an advance that promises to improve the lives of the more than 250,000 people in the United States who are paralyzed from the neck down, researchers announced on Wednesday that they have developed a wireless device that operates specially rigged chairs by means of a tiny titanium barbell pierced through the tongue. Merely by moving their tongues left or right across their mouths, essentially using it as a joystick, paralyzed patients have been able to move their motorized wheelchairs, as well as computer cursors. Tapping tongue against cheek, quickly or slowly, controls the chair’s speed. 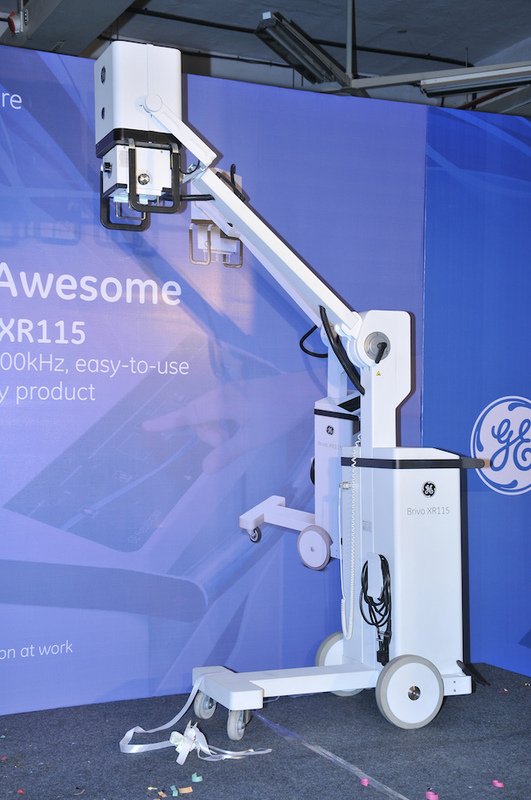 The innovation is especially meaningful for the most seriously paralyzed. Tetraplegics cannot use a joystick to operate their wheelchairs, as people with less severe paralysis can, and in many cases cannot even use voice commands: their voices are often so weak that recognition systems work poorly or not at all. Even more advanced assistive technologies fall short. Brain-computer interfaces (BCIs), which translate brain waves from the scalp into electrical signals that move a motorized wheelchair or computer cursor, require intense concentration, have slow response times and are vulnerable to electronic interference. The implantable versions are more reliable but can damage brain tissue. The most popular technology for operating a motorized wheelchair, called sip-and-puff devices and based on inhaling or exhaling into a tube, offers only four commands – forward, back, left and right—and is also slow and cumbersome. Engineer Maysam Ghovanloo of the Georgia Institute of Technology in Atlanta thought he could do better. About five years ago he and his colleagues began developing the tongue-based system. An early version used magnets glued to the tongue, but they fell off. Dr Anne Laumann of the Feinberg School of Medicine at Northwestern University, a co-author of the new paper, had an idea: use piercing to anchor the magnets in place. The device they came up with is a small magnetic barbell, which creates a magnetic field in the mouth. When users flick their tongues, it alters that field. The change is picked up by four small sensors on a headset with twin extensions curving around the cheeks, and relayed wirelessly to a smart phone, computer or iPod. The software translates the signals and sends them to a powered wheelchair or computer. For the new study, published in Science Translational Medicine, Ghovanloo and his team tested the tongue system on 11 tetraplegia patients from rehabilitation centers in Chicago and Atlanta and 23 able-bodied volunteers who already wore tongue jewelry. After just 30 minutes of training, everyone was able to move a computer cursor, clicking on targets on a laptop screen, playing video games and dialing phone numbers. Accuracy and speed improved with practice, even though subjects used the system only one day a week. After six weeks the tetraplegics were, on average, three times faster with the tongue system than with sip-and-puff, which six of the 11 (including Disanto) had been using. It was equally accurate. Using only tongue movements, the volunteers also navigated a powered wheelchair through a 50-meter-long course with 13 turns, 24 obstacles and occasional alarms signaling “Stop! Emergency!” Here, too, on average the 11 tetraplegics drove the course three times faster with the tongue system than with sip-and-puff, and just as accurately. To Disanto, an electrical engineer, the appeal of the system is aesthetic as well as functional. “With all the equipment that’s in my face” with the sip-and-puff system, “people saw that and not me,” he said. The tongue system is a vast improvement, but he encouraged the researchers to go even further, and they have: they are developing a version that dispenses with the headset and instead fits inside the mouth, like a retainer. Those home systems already exist, with many smartphones offering apps that control home appliances, lights and heating-and-cooling systems. “This is another example of how the field of rehab engineering and assistive devices is continuously evolving and benefiting from incorporating the emerging new technologies,” said Dr Daofen Chen, program director at the National Institute of Neurological Disorders and Stroke, part of the National Institutes of Health. Women suffering from diabetes and wishing to start a family should monitor their blood glucose levels and take a daily high dose of folic acid before pregnancy to avoid risk to their baby’s health, a new study said on Wednesday. The risk of stillbirth – when the foetus dies in the uterus or death during the first year of birth – was over four times greater in women with diabetes than in those without the disease. The team from Newcastle studied the outcome of over 400,000 pregnancies delivered in north of England between 1996 and 2008. ”We found that 2.7 percent of births in women with diabetes resulted in stillbirth, six times than the rate for women without diabetes, while 0.7 percent died during the first year of life, nearly double the rate in women without diabetes,” said Ruth Bell, one of the researchers. ”Stillbirths and infant deaths are thankfully not common, but they could be even less common if all women with diabetes can be helped to achieve the best possible control of their blood glucose levels before becoming pregnant,” added Bell. A team of researchers has identified a key metabolic enzyme that is required by the common malaria parasites at all stages of its life cycle for survival in humans. Co-first author Marcus C. S. Lee, PhD, associate research scientist in microbiology and immunology at Columbia University Medical Center (CUMC) said the study is important because most anti malarials are effective at killing the parasites only as they circulate in the bloodstream. However, the parasites can hide in the liver for years before reemerging and triggering a relapse of the disease. The other co-first author is Case W. McNamara, PhD, research investigator at the Genomics Institute for the Novartis Research Foundation. The study leaders are Elizabeth A. Winzeler, PhD, professor of pharmacology and drug discovery at University of California San Diego, and Thierry Diagana, head of Novartis Institute for Tropical Diseases in Singapore. The enzyme, phosphatidylinositol 4-kinase (PI4K), was found by screening more than a million drug compounds against Plasmodium falciparum, the parasite responsible for the most lethal form of malaria. Using this screen, the researchers found a class of compounds known as imidazopyrazines, which are capable of killing several species of Plasmodium at each stage of the parasites’ life cycle in its vertebrate host. The researchers identified the target of the imidazopyrazines by evolving parasite cell lines that were resistant against the drugs and then analyzing the parasites’ genomes for the changes responsible for conferring resistance. Those genetic changes pointed to the gene that encodes PI4K. The CUMC team, led by David Fidock, PhD, professor of microbiology and immunology and medical sciences (in medicine), used novel genetic tools to confirm that PI4K was being directly targeted by the imidazopyrazines.